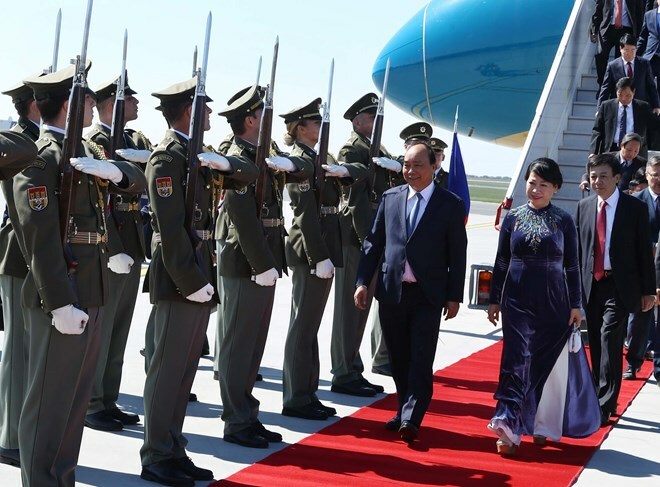 Prague, (VNA) – Prime Minister Nguyen Xuan Phuc arrived at the Vaclav Havel international airport in Prague, the Czech Republic, in the afternoon of April 16, beginning an official visit to the country at the invitation of his Czech counterpart Andrej Babis. The Vietnamese PM and his entourage were met at the airport by Czech Deputy Minister of Foreign Affairs Martin Tlapa, Czech Ambassador to Vietnam Vitezslav Grepl and Vietnamese Ambassador to the Czech Republic Ho Minh Tuan. During the visit, PM Phuc is scheduled to hold talks with his Czech counterpart, meet with the Speaker of the Chamber of Deputies of the Czech Parliament, pay a courtesy visit to the Czech President, and attend a Vietnamese-Czech business forum.